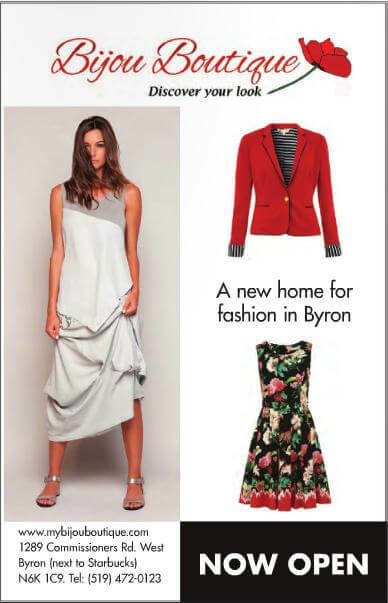 Since opening in November 2013 Bijou Boutique has been busy with lots of curious passers-by from the Byron area calling in to see our clothes. I am grateful to those who have become regular clients and also become friends in the process and thank you all for bringing some warmth in this very unforgiving winter. I had several occasions in that time in which clients commented that they did not know the store was here and they had not seen any advertising. Now that Spring is coming and the new season clothes are all arriving, I have begun to promote the store a little more widely. I was fortunate to be featured in the London Lifestyle Magazine March/April edition with an advert and some nice coverage for the store in their editorial copy too. The Lifestyle Magazine is distributed to many homes in the Byron area and hopefully it will serve the purpose of getting the new name out into the market.